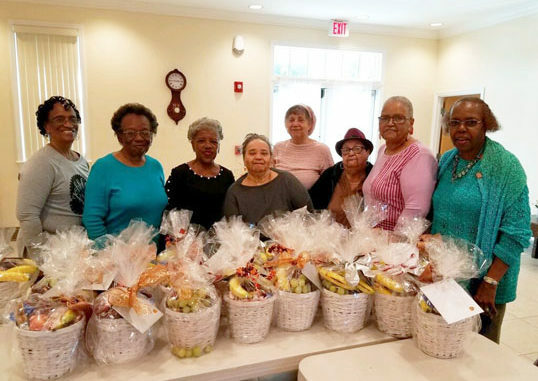 The members of the Walter Darcy Court of the Knights of Peter Claver Ladies Auxiliary (KPCLA) make Thanksgiving a priority every year. For the turkey? No. For the pumpkin pie? No. “We emphasize this holiday because it gives us the opportunity to continue the historic goals of our organization: giving hope and help to those in need,” says Claudine Pannell-Goodlett, Grand Lady and President of the local chapter/court. Founded in 1909, KPC was established to generate opportunities for black Catholics, fight racial discrimination, and to allocate resources to communities with the greatest needs. 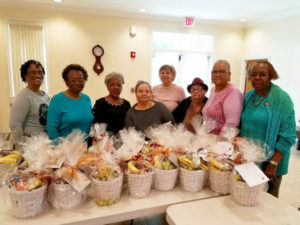 For more than a decade, local members of KPCLA have designed festive goodie baskets and delivered them to the sick and elderly around Jacksonville at Thanksgiving. But Claver’s good works are not limited to Thanksgiving or to the First Coast. “The Knights of Peter Claver is the nation’s oldest and largest predominantly black Catholic lay organization. It has an amazing history of civic engagement and social action. We are just happy to be a small part of it, especially during the holidays,” said member Marguerite Warren (Lady).